I work with anyone who wants to enhance the quality of life and experience the self in authentic ways. This work is effective for people who are interested in using the arts for healing purposes, people who want to move beyond traditional approaches of healing. It also works well for artists who are using the arts already but do not yet know how to make their art more personal and meaningful. And last, but not least, it works well for people who are looking for a more embodied lifestyle and meaningful experiences for their personal growth. Experience is not required in either movement, drawing, or writing. You only need to be open to using the arts as a tool for personal expression and creating awareness. An individual session gives you time and space to work with what is important to you at that very moment of your life. In the session I focus on a balance between checking in verbally, connecting to your physical sensations, and engaging with the tools of the expressive arts. Working in this way allows you to experience your encounter as a whole and to move beyond your thinking mind. You are further stimulated to use those creative strategies in your daily life and to enhance your quality of life in a sustainable way. 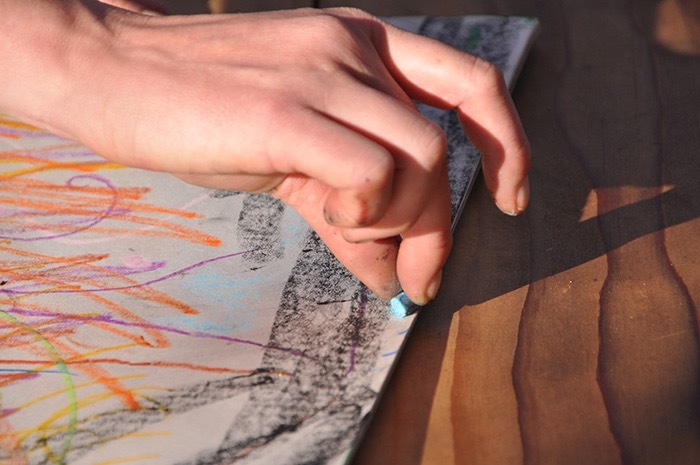 In a workshop we explore body parts, postures, and life themes using the tools of the expressive arts. We work solo and with partners and in ensembles to receive multiple forms of stimulation. The dialogue between sensing and expressing enlivens our life force, while we learn to listen to the body’s wisdom and the creativity of the imagination.